Telstra – Trap or Treasure? Back on the 22nd of May, I made a bet with one of the dealers on our floor. He thought Telstra would see a $1 handle before a $3 handle. I was on the other side, and after today, I’m more confident that I’ll prevail. We put a ‘pineapple’ on it and the stock traded within 2c of the target last week – but alas, we’re back in the mid 70’s today. I use this story simply to highlight the huge amount of varying opinion towards one of Australia most iconic companies – there are simply some exceptionally negative views on this stock. It’s hard to say they have no foundation, as the stock has been a clear ‘disaster’ in recent years courtesy of the white elephant NBN and explosive competition, however now more than ever the stock looks interesting. I’ll outline why below. Yesterday, Telstra closed at $2.91 down from a 12 month high around $4.40 but up from a 12 month low around $2.71. Looking longer term its traded as high as ~$9 in 1999 and as low as ~$2.50 around the time the Future Fund sold out in 2010. 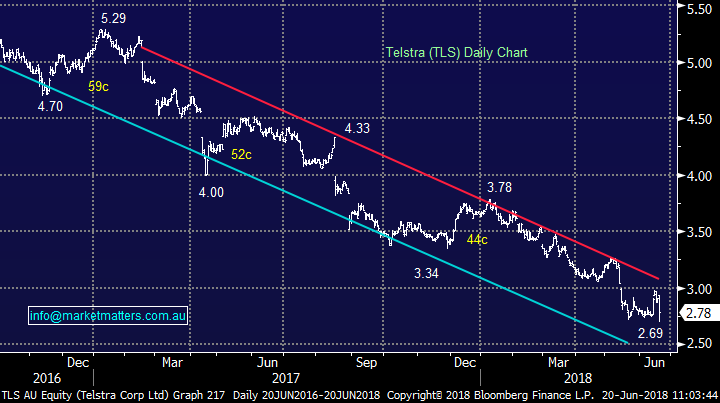 Between then and 2014, TLS more than doubled in price only to see its share price trade down to below $3 as it is today – clearly, the longer term picture for TLS has been one of mixed fortunes, but a number of clear opportunities along the way. Today the stock is trading at $2.74. Telstra is cheap in our view trading on a forward PE of 10 however clearly the validity of looking at a PE in terms of valuation sits with how well we can estimate earnings – something that was traditionally very easy for the Telstra of old but more difficult now given the changing industry. The dividend is obviously attractive at 22cps fully franked based on yesterdays close, which prints a grossed up yield of 10.8%, however the yield (as guided by TLS) is a pass through of earnings so if earnings deteriorate so too will the dividend. In other words, don’t hang your hat on it. Right now, the 22cps dividend is made up of a payout of 70-90% of earnings plus a special dividend underpinned by the NBN payments. Therefore a 22cps dividend is unlikely to be sustainable – 14cps looks more achievable which would put it on a grossed yield of 6.87% into the future. We know the NBN has been a clear negative for Telstra - a double impact – less upfront receipts and a big impact on recurring revenue as customers stop using Telstra’s phone and broadband services. 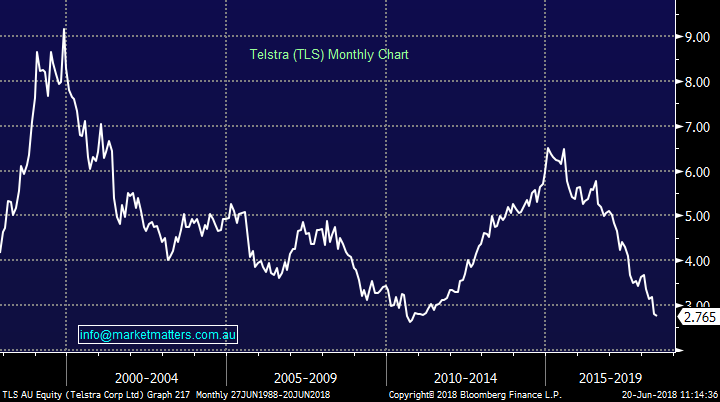 This means their current earnings are unsustainable (as shown by downgraded FY19 guidance this morning – more on that later), however the key focus for the company (and the market for that matter) now is on the look and feel of Telstra going forward. What’s their strategy to take of advantage of the huge growth in the Internet of Things, while addressing their clear operational short comings? Some big changes are needed. A few things worth mentioning here; Telstra still has some very valuable infrastructure and this value needs to be realised. Secondly, Telstra is very well placed to take advantage of the 5G opportunity. 5G will (in our humble opinion) become an integral part of the telecommunications landscape going forward, and TLS is exceptionally well placed to take advantage of it. As Andy Penn suggested this morning, 5G will be a profound technology transition. Advanced data analytics and artificial intelligence will underpin this, and finally, there is the opportunity to reduce costs across the business substantially. This isn’t new talk, but it is important non-the-less given the $3bn earnings hole left in FY22 (as the NBN payments roll off). Listening to Andy Penn this morning – and now with the division heads providing more detail, it’s clear that Telstra have taken the opportunity today to launch a huge re-vamp of the business, which does come at the expense of near term earnings. 2. RE the dividend, the current payout looks unsustainable – with more insight here likely at their full year result in August. 4.They are dumping legacy systems which willhurt earnings, but it will improve operations substantially moving forward. 1. Guided to FY19 EBITDA $8.7bn-$9.4bn which includes one-off NBN payments. Bloomberg consensus sat at ~$10.5bn. 4. They will be selling $2bn worth of assets which the market was already talking about – so no great shakes there. All up, short term holders of Telstra leading in to today will be disappointed by the earnings miss this morning – a big one, however as I detailed in the AM report, buying weakness based on the FY19 earnings miss makes sense. The ‘new vision’ for TLS may prompt slower, but bigger more influential money off the sidelines given the plans unveiled this morning improve the sustainability of future earnings. We like this aggressive approach taken by TLS today – not just another band aid solution! The above is an exert from the Market Matters Report. To get our latest market views and hear when we take new positions, trial Market Matters for 14 days at no cost by clicking here. What the hell is a pineapple? Would have thought a pineapple is the thing you're feeling the rough end of if you're a TLS shareholder.